I love V-Dog. My dogs love V-Dog. My dog Henry’s stomach especially loves V-Dog (he had tummy issues with other dog foods in the past, but not with V-Dog)! V-Dog is a completely vegan**, earth-friendly dog food company that makes sure your pooch gets all the essential nutrients they need to live long, healthy lives. They make awesome chewy breathbones as well that both my dogs go crazy for. 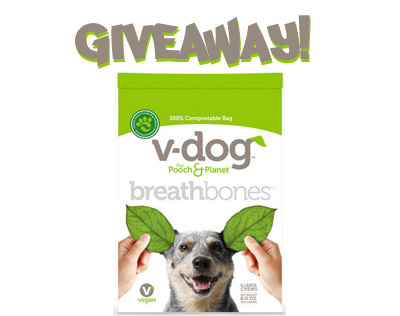 Thanks to the generous folks over at V-Dog, you can enter to win a free bag of breathbones for your own furbabies at the bottom of this post!